Let's set sail! After all, what could be better than sailing and seeing the world? And if you happen to be "on board" you might as well use your time to serve and do your duty. So why don't you join the Navy! We all know you're not going to get very far on board your ship if you don't look like a member of the crew. 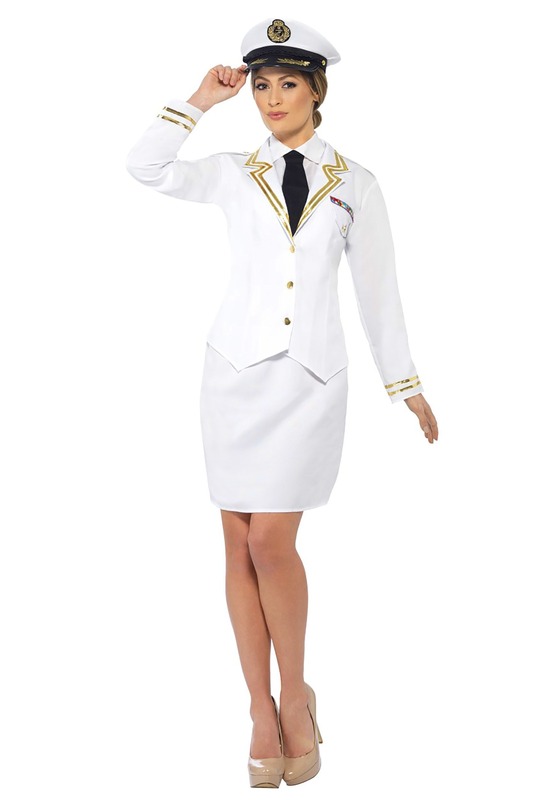 So look no further than this Naval Officer Women's Costume. Styled to look like a uniform that a real Naval officer would wear, it's like joining the crew, and not just joining, but giving yourself a promotion right off the bat. Full steam ahead! Whether you see yourself as a cool commander or the all important captain, you need to take picking out your uniform very seriously. And with the style and attention to detail on this costume, it'll fit the bill. In fact, we wouldn't be surprised if you have the coolest uniform in the crew! This jacket and skirt combination costume also includes a mock shirt front and a hat. All done in classic Navy-like styling. You know, gold trim, medals, and nautical logos... the whole kit and caboodle! With the high seas style that's sure to have you set up for Naval success, you're going to be both dressed to impress, and dressed to serve. Maybe you'll save the world when you enlist with the Navy, or maybe you're just going to have a ton of fun sailing and seeing the world, and enjoying the camaraderie with your crew. Aye aye Captain!